I had to look up "alvearium", not a common term. I was pointed toward "alveary", a word with two intriguingly different definitions: first, a beehive, or something resembling a beehive and second, the hollow of the external ear. Apian aspects don't leap out at one here, so I'm going with the latter meaning, thinking of these sounds flowing around my own alvearies. 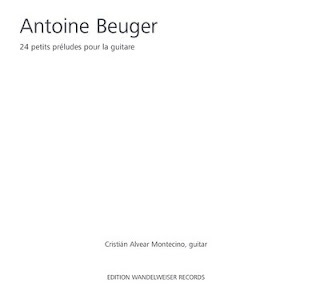 Of course, its root is also the middle name of the guitarist in question, Cristián Alvear Montecino, who plays so lovingly here. True, there are 24 pieces contained on this disc, which range in duration from 2:00 to 3:45, but in part due to the large amount of silence in which the single notes are swathed and also because the composition are "of a piece", the recording reads almost as a continuous work. The preludes seem to consist of sets of two to five notes, generally, perhaps always, in a rising pattern and very often diminishing as they appear, purely struck, with incredible gentleness, so much so that the final note in a given sequence sits right at the edge of audibility. The notes float away, evaporating as they go. Unlike some Beuger discs, the recording environment is pristine; I get the sense the pieces would work just as well in a sonically active space. In fact, part of me would like to hear just that, to have the notes just barely glimmer through the surroundings. But for the time being, this is more than gorgeous enough. What else canI possibly say about this? I sometimes had the mental images of beautiful, faint speckles on a wall. Other times of wafting dust motes, semi-periodic puffs drifting out of sight. If you visit Korn's site you'll see and hear a related example. 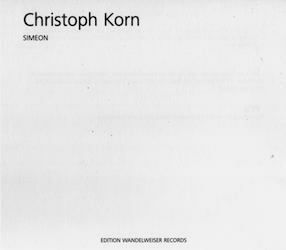 Korn presents two pieces, each 30 minutes long, which, though dissimilar in pitch (the second is higher), are otherwise tougher to prise apart than the Beugers above. Each is composed of a single sine tone, initially heard as a continuous sound for some 1 1/2 minutes, then repeated with silences interpolated, silences which increase in both length and number upon each iteration. 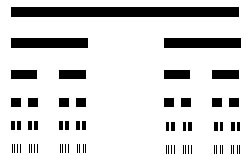 The last line, the eighth in the example printed in the booklet, consists of three very brief blips. Appended to each work, after 20 minutes of this process, is ten minutes of pure silence. If indeed that's the score for one of the two tracks, I'm unable to follow it; perhaps it isn't. The sheer length of the tones and their self-sameness make it all but impossible for this listener to get a handle on the structure as a whole, just some adjacent blocks. So my tendency is not to worry about it, treat each gap as a surprise, be generally conscious of their increased prominence, then lie back and enjoy the silence. Damned if I can say why, but the disc grew on me the more I listened. Not for everyone, by any means, but I'll be looking forward to hearing more of Korn's music. the score also resembles an i ching hexagram, down to the six lines - if the hexagram was diminishing/fading.